Only those who recognize their own limits can accept the great gift of salvation in Jesus Christ, which is why Catholics with disabilities are such important and powerful witnesses of faith, Pope Francis said. CNEWA supports a number of institutions that offer those with physical challenges both inspiration and hope, including the Paul VI Ephpheta Institute, which helps deaf children in Bethlehem and the Santa Lucia Home in Egypt, which helps young people who are blind. Visit our giving page to learn how you can support these and other wonderful institutions that are doing so much to uplift those most in need. The Soorp Badarak, or Divine Liturgy, is celebrated daily by the Mekhitarist community. He was sitting in a parlor of the Mekhitarist minor seminary, located in the Armenian capital city of Yerevan, where the Ethiopian-born priest supervises the education of those who hope to follow his path. The seminary opened in October 2004 and is now home to 22 boys, age 13 and older. Father Hovsep’s return to the land of his ancestors has more than personal significance for the octogenarian. The seminary also marks a significant step in the homecoming of an Armenian religious community after centuries in exile. Read more about The Long Road Home in the May 2007 issue of ONE. Mother of Coptic Orthodox pope dies (Ahram Online) The mother of Pope Tawadros II, head of the Coptic Orthodox Church, passed away on Friday morning, spokesman Bishop Royce Morqos said in a statement. The funeral liturgy will be held at St. Mark’s Cathedral in Alexandria on Saturday. In this image from 2011, a Christian cleric clasps hands with a Muslim sheik during a rally to demonstrate unity between Muslims and Christians in Cairo, Egypt. With mostly bad news coming out of the Middle East, it is encouraging to see that Christians and Muslims are working together in Lebanon to build peaceful relations. The meeting took place on the Solemnity of the Annunciation (25 March), a national holiday in Lebanon and a day when both Christians and Muslims honor Mary, the mother of Christ. The meeting was organized by the St. Joseph University Alumni Assocation and the College of Our Lady of Jamhour. “The Virgin Mary and Islamic-Christian Dialogue” was the theme of the address given by Rev. Miguel Angel Ayuso, secretary of the Pontifical Council for Interreligious Dialogue, during the meeting. Rev. Ayuso concluded by analyzing the role of Mary as a model for both Muslims and Christians. On Friday 21 March 2014, fighters from the Islamic Front and the al Qaeda-linked Nusra Front launched a surprise attack from the Turkish territories at the Syrian-Turkish borders in the north, seizing the Armenian Christian town of Kassab after taking the nearby border crossing. The attack began at two in the morning. The inhabitants of Kassab, who are 95 percent Christian Armenians, were given only two hours to leave their houses or else risk getting killed. Rebel fighters have also struck deeper into Lattakia province, attacking the town of Solas to the south and firing rockets overnight into Lattakia city, killing eight people. This has raised international concern, since the port of Lattakia is the main transportation hub shipping Syria’s chemical wepaons out of the country to be destroyed. The attack also deepened the conflict between the two neighboring countries, especially since Syria accused Turkey of providing military cover for the rebel attack on Kassab, saying Turkish forces fired into Syrian territory. The Al Qaeda attack and takeover of the Kassab border crossing has caused up to 2,000 Armenian Syrians to flee the area. Mass looting and destruction of religious sites was reported by residents (similar to acts reportedly carried out in the city of Yabroud). Armenians are once again refugees like their ancestors who fled the Armenian genocide decades ago. Some 680 Armenian families, the majority of the population of Kessab, were evacuated to safer areas in neighboring Basit and Lattakia; 300 Armenian families found shelter in their relatives’ and friends’ houses, while the remaining 380 have sought refuge in the Armenian Church’s hall. There is now concern about the fate of 10 to 15 families who couldn’t leave their village or chose to stay in their homes. On Saturday 22 March, Syrian troops launched a counter-attack in an attempt to regain the border crossing point, according to eye-witnesses and state media. However, the following day the extremist groups once again entered the town of Kassab and took the remaining Armenian families hostage. They reportedly desecrated the town’s three Armenian churches, pillaged local homes and occupied the town and surrounding villages. CNEWA immediately responded to the urgent need and provided the refugees with emergency items for 380 families in Lattakia, through its contact with the Armenian joint committee composed of an Armenian Catholic priest, an Armenian Apostolic priest, an Armenian Evangelical pastor and two social activists. CNEWA also supported 50 families who fled to Beirut through the Karagheuzian center in Bourj Hammoud. To learn how you can support the refugees, visit our emergency giving page for Syria. U.S. President Barack Obama gave Pope Francis a small chest full of fruit and vegetable seeds that are used in the White House Gardens. The seeds were inside individual blue velvet pouches. “These I think are carrots,” the president said as he opened one of the pouches. The president said the idea for the seeds came after he heard that Pope Francis had decided to open to the public the gardens at the papal summer residence in Castel Gandolfo. The basilica’s cornerstone was laid by Jesuit Father John Carroll, the first Catholic bishop and archbishop in the United States. Read more about the gifts. And CNS also has additional details about the meeting. Father Ihor Hiletsky shows a picture of the grave of alcoholism in the village of Stankiv. According to a 2008 study on alcoholism conducted by the World Health Organization, Ukraine ranked at the top of the list of countries with the highest rates of alcohol consumption among children and young people. With a population of 2.5 million people, the Lviv Oblast (or province) falls within the mean of Ukraine’s 24 oblasts with respect to substance abuse, which includes alcoholism and drug use. Last year, between 1 January and 1 July, public health authorities registered 428 cases of alcoholism and drug addiction among people under the age of 18, and 35,248 cases among adults. ...In 2003, Viktor Proskuriakov took part in “The Burial of Alcoholism,” a ritual in which parishioners from the Greek Catholic Church of the Holy Trinity in the village of Stankiv joined together and took an oath to give up drinking and end alcohol dependency. The crowd gathered around an open grave, which was filled with liquor bottles, to pray and symbolically bury the disease. Marked with a tombstone to remind villagers of their oaths, the grave can be seen from the road leading to the church and rectory. Father Ihor Hiletsky, who serves as the church’s pastor as well as the coordinator of youth programs for the Greek Catholic Eparchy of Stryj, organized the burial. “The idea to conduct a series of events exposing alcoholism as a sinister evil occurred in 2001 just after I had come to Stankiv,” says Father Hiletsky. 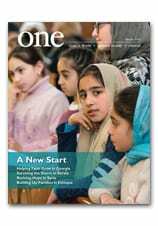 Read more about Burying Alcoholism in the January 2010 issue of ONE.